I was tagged by Lynn Grieveson to join in this blog tour! I have been a bad blogger, so it is good to have a prod to post again! Last November I was very lucky to travel to the USA and meet many of the amazing women who are part of the Designer Digitals Creative Team. I took an extended vacation, first with Carol and some of the other ladies from the team and then with the family. I took 7000 photos! So my project right now is to sort them out put them into a book or two or three! It will take too long to scrap them so I've decided to use Lightroom's Book Module to create the pages. I've added Designer Digital products to the page background and into photo spots. I've also just finished reorganizing my computer space with a little help from Ikea. I picked up some photomats yesterday and popped some of my photos into the Billy bookcase doors above my desk. Here it is with the chair I recovered, a new Ikea desk-top and recycled cupboards transformed with new handles from Ikea. 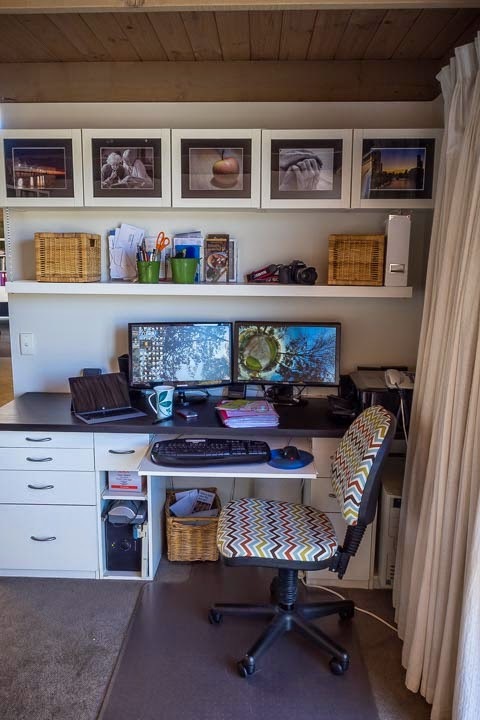 Love this space - cheap, cheerful and functional! 2) How long does it take to create a project? Hmm... define a "project"! I can spend a couple of hours on a single page! I generally try to finish a page in an hour. These Lightroom pages take maybe 10 minutes, but it might take me another hour to sort through my photos and edit them first! For my current project, I'm loving using the pencillines goodies from Designer Digitals to add a bit of informality to my pages. 4) How do I become inspired and stay inspired? The web is a wonderful place! There is so much inspiration there. I love to browse the galleries and occasionally get lost in Pinterest. You can see how I used my Pinterest shelving board helped me design my working space! I spend a lot of time in planning! Of course when I'm busy or under the weather, mojo disappears, and usually it's time to take it easy and wait for inspiration to appear out of the blue. Joining the local camera club has helped me stay inspired with my photography. Each month there are activities, excursions and competitions which I participate in whenever I have the time. 5) What is my signature style? It is always hard to pick your signature style. I think it's easier for others to do that. I know I tend not to use a lot of layers on my pages, I prefer to focus on my story and the photos. I do create a lot of travel books and prefer double page spreads. I find having a full page photo on one side makes it so much easier. It provides instant contrast with the white space and photo-block on the facing page and is super quick to do! I like white backgrounds and subtle use of other elements such as paint spatters or the pencil lines I'm currently using. I love to use lifted white photo frames and brads or flair to add dimension. OK... the whole idea of a blog tour is that you hand link up a few other bloggers who have participated. Many of my creative blogging friends have already posted their blog tour entry. And if you'd like to visit a few posts by my other friends: Carol, britgirl (Mel) . Lovely to see you pop up in my Feedly reader - I kept you in, hoping you'd not gone forever :). And fascinating to see your streamlined space and your photobook - I am just about to begin my first ever one, and found your section on style very interesting, as I am pondering the design right now. Good to see you!